(ANS – Takoma Park) – Don Bosco Cristo Rey High School welcomed Cardinal Joseph Zen, SDB, bishop emeritus of Hong Kong, as celebrant and preacher for the solemnity of St. John Bosco on January 31. Mass was celebrated at 10:00 a.m. in the church of Our Lady of Sorrows adjacent to the school in the presence of students, staff, Salesian Cooperators, and friends of the school. Cardinal Zen had been visiting the U.S. for several days and earlier in the week was honored with the “Truman-Reagan Medal of Freedom” by the Victims of Communism Memorial Foundation on account of his staunch defense of human rights and freedom of religion in China. He was accompanied by Fr. Joseph Ng, superior of the Salesian Province based in Hong Kong. The priests of the local Salesian community also concelebrated the Mass. Basing his homily on the gospel (Matt 18:1-6,10), the cardinal noted how Don Bosco put into practice Jesus’ exhortation to take care of the little ones and the poor. He asked why Jesus blesses the poor and responded that suffering is part of life because all of us are sinners; but Jesus, the Good Shepherd, takes care of his sheep and through his own suffering on the cross leads us to salvation. Cardinal Zen said that believers live by hope in something this is already present, a first installment in salvation, because of God’s love. Life without love is meaningless, he said, and life without suffering is not possible. The cardinal noted that the Mass was taking place in Our Lady of Sorrows Church and linked the Virgin Mary’s suffering, in mystery, to the joy of salvation that followed her sorrows. 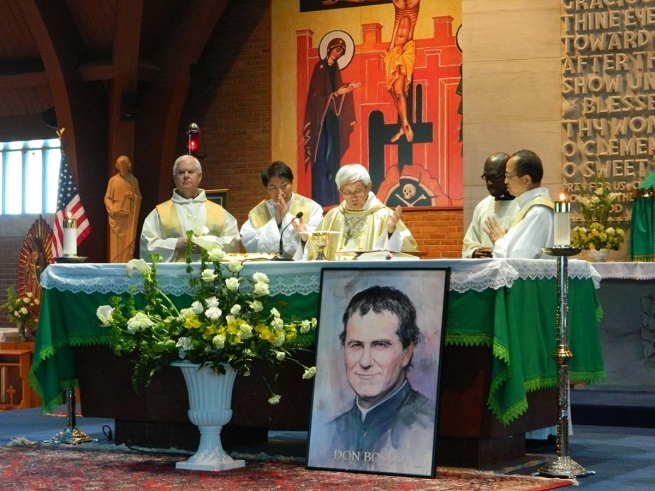 Turning again to St. John Bosco, the cardinal said that he was always happy in spite of the difficulties of his life because he always knew that he was on his way to Paradise. The cardinal, so well known for his defense of the freedom of the Church, spoke briefly about the current situation in China. He mentioned Pope Benedict XVI’s encouragement to Chinese Catholics to persevere in the Faith even if they have to suffer for it. Christians, the cardinal said, are always winners if they are on God’s side, if they are little ones who put their faith in God. Through the humble servant of God St. John Bosco, he concluded, many little ones got the help they needed in life and grew up to help others also. DBCR’s students and staff very much appreciated Cardinal Zen’s visit. In the evening Cardinal Zen and Fr. Ng visited the Salesians’ new residence in College Park, Md., and took part with the community in Evening Prayer II of St. John Bosco.